Fight On! #7 Is Out, Huzzah! The new issue of Fight On, my favorite gaming magazine, is now available at Lulu. This one does not include my “Random Events Make You Say Yes” essay, which has been held over to #8. 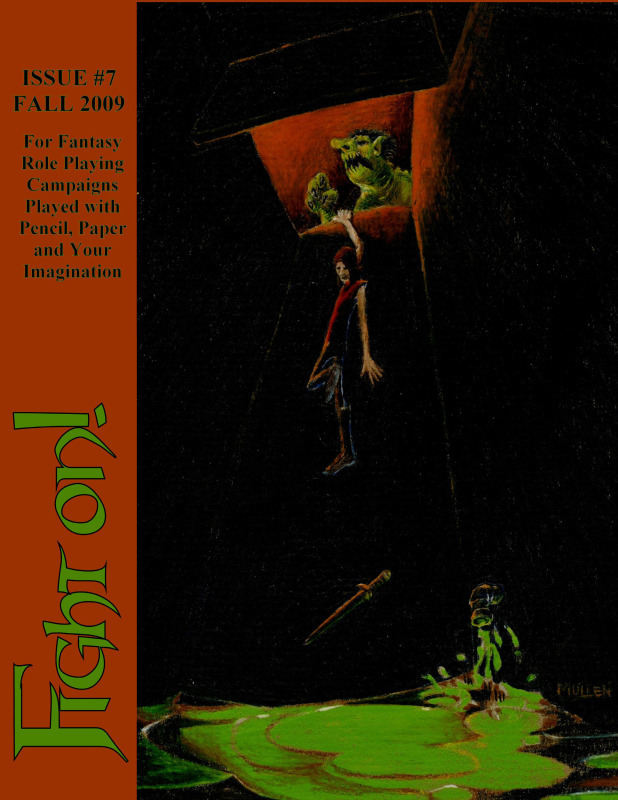 That issue is devoted to Erol Otus, which may inspire me to write a second piece devoted to how at Anonycon I was able to use the evocative player handout illustrations he did for The Hidden Shrine of Tamoachan to let the players’ input do the work of improvising a trap/puzzle encounter. What better way to pass the time while you’re waiting for all that than to read and re-read #7? The robots at Lulu are printing mine at this very moment, but the table of contents indicates that it contains such delights as Adam Thornton’s “Wandering Harlot Table” and “One Time at D&D Camp” by Harnish & Robbins. Enter the code “HUMBUG” when you checkout at Lulu and save 10%!